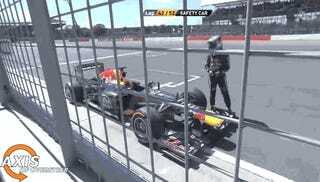 Remember when "honorary Brit" Sebastian Vettel's Red Bull did a fine impression of a British car and broke down at the British GP? Seb tripped, too. Our friends at Axis of Oversteer whipped this gif up when they weren't busy giving a fairly detailed explanation of Pirelli's tire woes. There is no word if Vettel was doing his best Mr. Bean impression for this trip. That guy sure is a jokester!